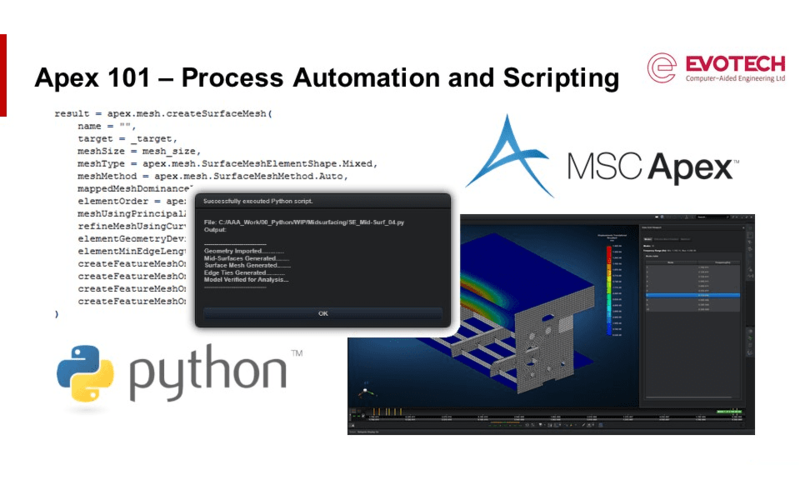 MSC Apex 101 for Aerospace Applications – Introduction to Process Automation and Scripting | Evotech Computer-Aided Engineering Ltd.
A recording of the webinar (originally presented on 25/11/2018) is available here. Effective use of FEA simulations plays a big role in the design and development of complex aerospace structures. From assembly management, to material selection and load computations, successful design of aerospace structures requires engineers perform a wide variety of analyses and modeling steps. To overcome some of these challenges, MSC Apex Harris Hawk delivers efficient automation methods that enable engineers to expedite the modeling process and meet hard deadlines. FEA automation benefits companies in many ways: It can significantly improve modeling speed and efficacy while reducing the chance of potential errors associated with the manual process. Additionally, automation can provide a standard process across a company, so people can work in a consistent manner. FEA automation provides extended capabilities through use of customized scripts that introduce new solutions and post-processing options.